Can Garbh Sanskar, Music and Books help to make your unborn child super intelligent? Do you want to understand what Garbh Sanskar or Garbh Sanskar music is all about? Well, answer me this! Why do Israeli women solve math when pregnant? How Prahlad whose father was a demon become a Vishnu worshipper? How did Abhimanyu break into the Chakarvyu, without having any prior knowledge about this aspect of warfare? It was all because of Garbh Sanskar. Garbh Sanskar is an ancient Indian prenatal and pregnancy parenting science. Garbh sanskar is based on the basic theory that the mental and behavioral development of a child begins from the moment an embryo is conceived. This concept dates back to 1500 years BC and is as old as Ayurveda. Skeptical? I know, I was too! So read on and if you feel it is worth a try, then only go ahead! It’s not only ancient Indians, but Jews also believe that children can be taught even while they are in their mother’s womb. This is why Israeli pregnant women carry Math books with them and try to solve math problems with their spouses. Some even attend Math classes. If you’ve ever wondered why the Japanese, Chinese and Korean are so intelligent, it because they have a tradition called Taikyo during pregnancy. Taikyo, like Garbha Sanskar is a traditional prenatal science which involves talking and singing to the unborn baby, creating special bond. Chinese believe that this makes their children extra intelligent. Chinese women are not allowed to attend funerals, and asked to look only at beautiful things when pregnant. In western cultures especially the US, certain types of music such as Mozart or special brain enhancement music is believed to have a positive effect on the unborn child. Here I just wanted to mention about OmDaddy, Daniel Eisenman whose video of him calming his baby by chanting “OM” had gone viral. I had long suspected that the couple must have been singing or chanting OM during their pregnancy, and was reaching for some confirmation in this regard. While researching this post In this video they do mention how they used to do “Oming” around the house all the time and even during the birth of the baby. As Indians, our ancestors used to similar things, especially kings and queens who would have brahmins chanting mantras for the birth of a healthy baby. Westerners are seeing the wisdom in all of our traditions and adopting them, while we are moving further and further away from them. For science geeks, also there is a lot of medical research being done today to prove that both ancient Indians and Chinese were wise beyond their times. Science has proven that 60% of a baby’s brain develops inside the womb. Unborn babies, from the seventh month onwards can hear and respond to their parent’s voices and music. The first sound that a baby hears is the mother’s heartbeat. Isn’t it amazing that when the mother holds a crying baby close to her chest, s/he stops crying instantly? When to start Garbh Sanskar during pregnancy? “Garbh” in hindi means womb and “Sanskar” means spiritual education. It literally translates into teaching spiritual education while in womb. Garbh Sanakar’s aim is to help couples give birth to a beautiful, vigorous and intelligent child. It is a way of teaching and bonding with unborn baby in womb during pregnancy. Garbha Sanskar is an ancient Indian prenatal care system and part of Ayurveda. It advocates planned parenthood, where pregnancy should be by choice, and not by chance. Though Garbha Sanskar can be started at any stage of the pregnancy, it encourages couples to have planned pregnancies. One should start preparation for pregnancy three to four months prior to conception. Garbh Sanskar describes this theory as “Supraja janan” or “eu-maternity” This “Supraja janan” involves preparing the couple for pregnancy three months before actually conceiving. The mental, spiritual and physical preparation of the mother-to-be is a must before conceiving. Garbh Sanskar begins with “pinda shuddhi” or the purification of the gametes – both the male sperm and the female ovum. When the couple purifies and detoxifies their bodies before conceiving, it removes toxins from their reproductive organs as well. Fresh sperm is produced in a man’s body every day. So, the sperm being produced after detoxification would be free of all the toxins that the father may have accumulated in his body due to bad habits like smoking, drinking, poor eating habits and poor sleep patterns. For the woman, pre pregnancy detoxification is even more important, as the baby grows in her body. Female babies are born with all the “ovum” or eggs that she would need throughout her lifespan. Though the eggs are inactive till puberty, a woman cannot produce “fresh” eggs like men produce sperm. A woman who is thinking about conceiving should follow a good detoxification process so that the resulting baby gets a head start. A team of scientists examined the umbilical cord blood of 10 U.S. babies and found a total of 287 industrial chemicals. Of these, 180 were carcinogens and 217 were toxic to the brain. A newborn baby, who has not eaten anything, nor been exposed to our environment, already has 287 chemicals, coursing through its veins!! According to Garbh Sanskar, unborn fetuses are not without sentiment; in fact they are highly responsive capable of understanding and responding to external stimuli. Positive thoughts and feelings of the mother, listening to vedic mantras and soft rhythmic music has positive impact on the growth on baby. Garbh Sanskar believes that children born of mothers who adhered to these principles have enhanced intellect and memory power. The baby is protected from negative energies. Garbh Sanskar also helps to improve the immunity system of the newborn. Helps in forming a deeper bond between baby and the mother. Breastfeeding and latching on becomes easier for the baby. Garbh Sanskar also has many positive effects on would be mother by soothing her anxieties and worries throughout pregnancy. Helps mothers to adopt favorable attitude toward the changes in her body. It is also believed to increase the chances of normal delivery. It also helps a woman stay positive and avoid or overcome postpartum depression after baby is born. Chakra means wheel in Sanskrit. In Ayurveda and also in Yoga Chakras are considered as wheels of spinning energy. 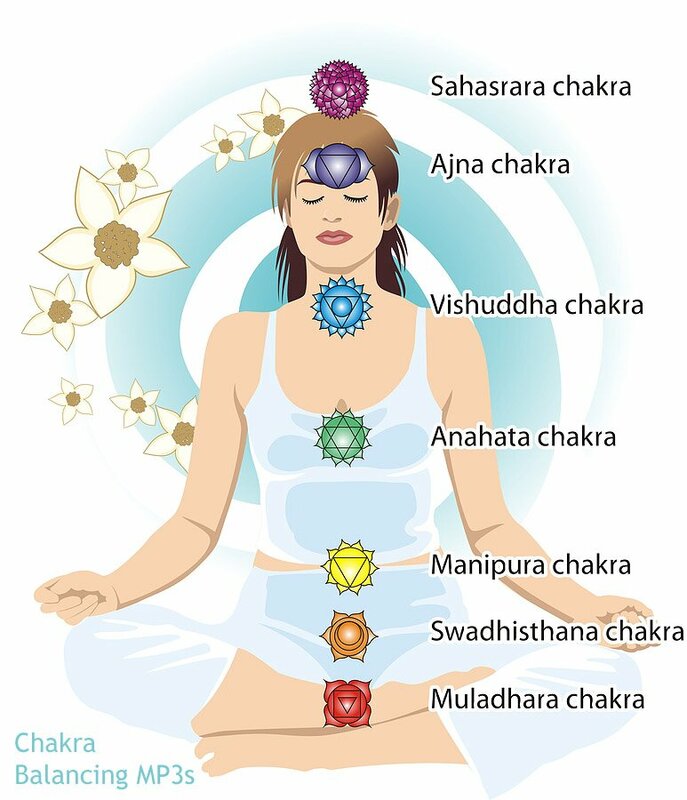 The human body is believed to have many Chakras, but the following seven are considered primary. Ghee is the base in many Ayurvedic medicines. Even Garbh Sanskar prescribes two types of herbal ghee. One tablespoon of herbal ghee is to be taken from the 4th month of pregnancy to the 9th month. Many southern states of India, especially Kerala women drink this. Kalyanak Ghrita: This ghee is to be used in the 4th and 5th months only. The growing brain of baby is greatly benefitted from this. The mother is also benefitted as it helps to prevent anemia. Thanka sree Ghrut: From the 6th month to the 9th month, this special ghee is to be used. Thanka sree Ghrut helps in the complete development of the baby. It also helps the mother to carry baby to a full term normal delivery. Garbh Sanskar prescribes a special prayer for welcoming the divine into the womb of the mother. A divine soul is invited with prayers to take birth though the mother to be’s womb. Helps to find the right time of conception, choosing right nakshatra through astrology charts. Using meditation and visualization specifically white light visualization and benevolence beaming helps parents to establish a dialogue with the unborn baby. Undergoing Sun Therapy, so that it kindles the fire within. Mantra Therapy involves reciting the “beej” or seed mantra so that conception takes place. Music Therapy to relax and stimulate the brain. Music also helps to open up the Chakras of the body. Food Therapy, Prana Therapy, Naturopathy, Mudra therapy, Swar therapy are also part of Garbh Sanskar. Together they ensure holistic development of the baby. Garbh Sanskar also teaches brain stimulation technique. This enhances the co-ordination between the right and left brain of the developing baby. There are many Ayurvedic centers which can guide you through the entire process, one can also go for online Garbh Sanskar classes if time is limited. Sometimes, with a new baby coming there is just too much to be done and even taking an online course can be too demanding. So, here are some DIY tips which can help one do part of Garbh Sanskar without much hassle. Do a pre-pregnancy detox for both the prospective mother and father. Do not attempt any detox even if you doubt that you are pregnant. Follow a good wholesome diet during pregnancy. Adopt healthier eating and sleeping habits. Reduce intake of cigarettes, alcohol, soft drinks and other junk food if consuming. To enhance parent and child bonding the couple should spend time reading, talking or singing to the unborn baby. Listen to Indian instrumental or classical music, Samaveda mantras and Garbh Sanskar Sangeet whenever you can. CDs of this kind of music is available online. Listening to good music which elevates the mood and helps you to think positive will ensure that your baby also gets good vibes and energy. Try to keep the mother to be happy at all times, aw/y from sad thoughts. She should avoid watching horror or depressing movies as far as possible. Read good spiritual books look at beautiful works of art and try to have only positive and constructive thoughts. Try to pray at least once in the day and chant some mantras. If you do not know any, don’t worry, just listening to bhajans and Gayatri mantra will also have positive impact. Garbh Sanskar is about is speaking to your baby, staying positive, meditating and doing a bit of yoga! Let go of silly grudges and all your negativity. Leave behind your worries – be it personal and professional and focus on being happy and positive. Prayer every day and try to visit places of worship whenever you can. Surround yourself with positive people who will help you to feel good about yourself and your beautiful journey ahead! I hope this post helped you to gain some understanding about Garbha Sanskar. Here, I would like to share my own experience. I had researched about Garbh Sanskar and convinced my husband to go for detox prior to conceiving. He has very poor eating habits. He also smokes a lot. Due to these reasons, I was extremely worried about how I was going to have a healthy baby. Both of got an ayurvedic detox done, after which we genuinely felt refreshed and reenergized. But we (and by we I mean he) not able to maintain those healthy habits and fell back to our old lifestyle. We conceived pretty quickly within the first two months of trying! Since my hubbys job is transferable, we moved house during my 4th month of pregnancy. Due to this I was never really able to join a Garbh Sanskar program. So I did the DIY Garbh Sanskar which I have mentioned in the blog above. From 4th month I moved to my parents place in Varanasi till my 8 th month of pregnancy. Since I was at home, and no household chores, I took good care of myself. I ate well; I did prenatal yoga and listened to Garbh Sanskar mantras and other prenatal soothing music. My mom always made it a point to make me do puja, go to satsangs and listen to mythological stories about Ram and Krishna. Well, my mom also believed that if you ate three pearls on three consecutive days you would have a boy! So, go figure what works for you!! Mine was a dream pregnancy. I didn’t have any problems either conceiving or carrying. Hardly any acidity or heartburn. I lived in three cities, packed and moved house and travelled alone. My baby was overdue and I personally feel if my parents (who had gone through a tough pregnancy with my sis-in-law) hadn’t pressured my doctor, I would have had a normal delivery! Well that’s a story for another day. When I think of having another child, I plan to follow all the principles of Garbha Sanskar. The major reason being even if it does not help, it is in no way going to harm! But that’s me! What about you? Would you be willing to try this ancient Indian practice of planned parenthood and prenatal care? Have you tried Garbh Sanskar or any other traditional prenatal course before? How did it pan out? Do share your experiences in the comment box.